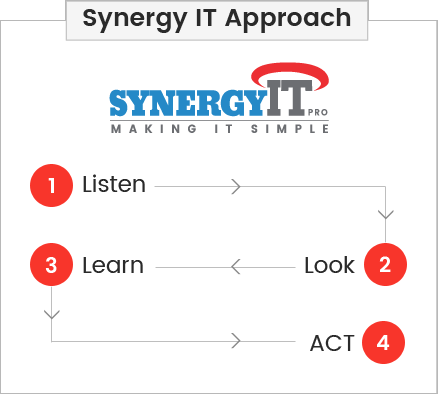 Access the Best in IT Consultancy..
Synergyitpro: one of Australia’s leading infrastructure service providers. Synergy IT Pro has a customer base second-to-none, with key Australian and international ‘blue-chip’ clients. It is one of Australia’s best integrations and full-service providers of personal computers, networking solutions and associated services. Synergy IT Pro offers small to medium scale, on-time systems installations as well as customized solutions and support. Synergy IT Pro is based in Melbourne but with accredited service and support agents throughout regional Australia. Synergy IT Pro is an Australian, unlisted public company. It is a major provider of IT infrastructure services and solutions. Synergy IT Pro specializes in managing the life cycle of IT infrastructure by reducing the total cost of ownership. It ensures you maximize the return on your investment by understanding your IT problems and delivering scalable and implementable solutions. A systems integrator, Synergy IT Pro ensures all infrastructure components work together as a total solution, with the capacity to be truly managed. Its solutions are designed to evolve and support rapidly changing technology needs and increase the productivity of end-users. From its inception in 2000, Synergy IT Pro has experienced sustained and controlled growth. This growth has been driven by its ability to provide a customized solutions approach. Using cutting-edge technology and world’s best-practice, and with focus on the core IT capabilities of provision, support, design and implementation, sales have grown considerably since conception. Synergy IT Pro is one of Australia’s leading infrastructure service provides and operates on a national scale, servicing small to medium businesses. It continues to build on the partnerships and accreditation it holds with all major industry vendors. Synergy IT Pro is a leader in implementing strategically-based winning solutions for greater IT efficiency and business profitability. It maximizes emerging and relevant technology initiatives to meet changing business needs by ensuring IT trends and changing business requirements are reflected in its strategic goals. With the enduring pressure on organizations, IT implementation across the board sometimes doesn’t get aligned with the ongoing perspective of the business. This has become the biggest challenge for an organization to overcome. Synergy IT (Operations in NSW, QLD and Perth) with its vast experience has helped many businesses to understand, plan their IT to achieve their objectives and goals, saving time and money. With the industry standard certified professional, Synergy IT works on ITIL based model, to learn the business-aware information and ascertain the business specific Service Level Agreements, which makes us stand out from the rest. With our technical expertise, we are confident that we can streamline your business by supporting and maintaining the technology that drives your business. As an experienced ICT Solution provider, we deliver what we promise. The quality and professionalism of the Synergy IT engineers are the highest that we have encountered from any service provider in the IT industry. They all seem excited to work with us here and stay with a problem until it is resolved. Synergy IT provided us with a Service Level Agreement (SLA) under their Managed Service offering and have exceeded all of the response times and support they committed to. Highly recommended! Great service and good predictions. Highly recommended. At the beginning I was susceptible that they can do the job but I was amazed how they handled the whole thing quite well. Very happy with the quality of service. Highly recommend Synergy IT Professional for IT support and its services, hard to get hold of them sometimes but when it comes to support they provide quality service.